Your mouth and teeth will be examined and a full detailed orthodontic assessment will be made of your current dental functional and aesthetic problems to form the basis of the online technical submission to Invisalign. Very accurate silicone impressions are taken of the teeth, these are CAT Scanned at Invisalign to create a set of virtual models to plan the treatment, the virtual models will eventually be used to fabricate the aligners to move the teeth. A digital panoramic dental x-ray is taken similar to the one below (left). Sometimes a cephalometric x-ray below (right) is also taken, this is helpful in complex cases. A set of eight digital photos need to be submitted. We take three extra-oral and five intra-oral photos like the ones below. We then prepare a treatment plan with details of your specific dental problems and what the aims of treatment are in terms of desired positions of teeth and other aesthetic and functional considerations etc. This report along with the eight photos and X-rays are all sent electronically via Internet to Invisalign in California. The dental impressions are sent by UPS Italia to arrive the next day in California. The silicone impressions are CAT scanned to produce highly accurate virtual digital models. A type of AUTOCAD software is now used to move the teeth on the virtual models into the desired aesthetic positions, now we have two models “before” and “after”. We then work on the simulations over the net and make modifications until we are happy with it. The software then computes a series of sequential steps between the two models to create a video simulation of the stages of treatment and this is shown to you to evaluate prior to committing to treatment. This is obviously a big oversimplification but it is essentially what happens. Then we view the ClinCheck together, using a computer simulation, you see your malocclusion treated virtually, in front of your very eyes, it is quite amazing to see. If you want any changes to the case we can now do them. 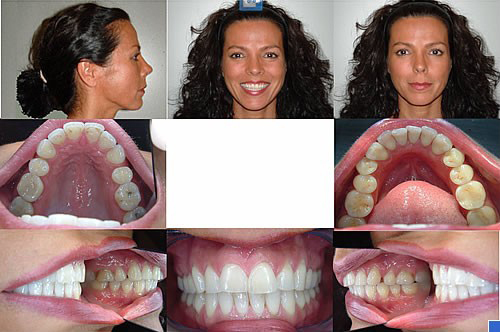 Once you give your approval to the proposed course of treatment, it then takes about just under two weeks for your aligners to be custom manufactured and arrive in Italy. You are now ready to start your treatment.